Growing Well partners actively and regularly engages with the following organizations, spanning their boundaries and ensuring coordinated action. 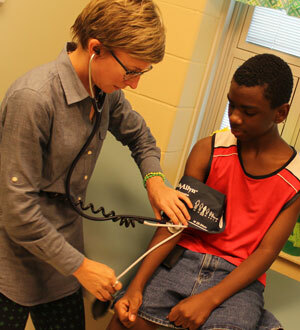 Since 1999 Interact for Health, working with a broad coalition of health, education and civic partners, has funded 35 SBHCs in eleven school districts serving 35,000 students in Greater Cincinnati. The community, and Growing Well, is fortunate to have the involvement of very experienced SBHC practice leadership. Dr. Mona Mansour is the Director of Primary Care for Cincinnati Children’s and Lisa Crosby is the Program Lead for SBHCs. Dr. Mansour is a primary care physician with specialties in asthma, school health, primary care in underserved populations, and primary care redesign. She also has a Master’s degree in Epidemiology and is a Professor in the University of Cincinnati’s Department of Pediatrics. Dr. Crosby has MSN and Doctor of Nursing Practice degrees and specialties in asthma and mental health. The Cincinnati Health Department is generous with sharing Marilyn Crumpton, MD (its Director of School/Adolescent Health) with many segments of the community, including CPS, Community Learning Centers, Growing Well, and the Ohio School-Based Health Alliance. CHD staff has rallied in many ways to respond to the call for health services in local public schools. The Community Learning Center model started within Cincinnati Public Schools. CPS has provided strong leadership at the top of the organization, with Superintendent Mary Ronan who takes time to serve on the Leadership Advisory Committee, as well as at the school level with coordination among SBHCs, teachers, staff, administrators, and the Local School Decision-Making Committees, comprising school employees and community volunteers. Darlene Kamine, the Director and Founder of the Community Learning Center Institute, has played a vital role in supporting school nurses and school-based health care, establishing Community Learning Centers in Cincinnati, and advocating for data systems that include health and academic data. CLCI promotes site-based governance and provides Resource Coordinators who manage the many and varied community partnerships. Among her many other accomplishments, Ms. Kamine helped establish Growing Well; helped to achieve buy-in from community partners in supporting and submitting data to the health/academic database; attracted new sources of funding; and played a key role in successfully advocating for the expansion of SBHCs.